You’d like to take your family on a winter holiday, but you or your kids don’t ski? No problem – at the Ski Hotel Perner in Obertauern you can call on the know-how of the local ski school. A ski kindergarten is located on the practice slope directly behind the hotel where your children can learn how to maneuver their skis in a playful way or improve their skills. The sports shop at Hotel Perner ensures that you are fitted with the necessary equipment, either to rent or buy. Of course trendy and functional winter sports wear can also be purchased or you can treat your own skis to service. 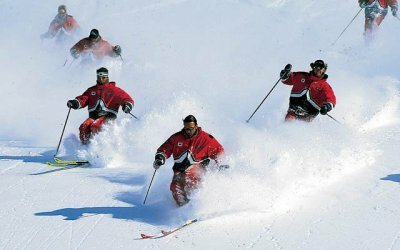 Expert staff will assist and advise you on all areas of winter sports, so take advantage of the comprehensive service at the sports shop in your ski hotel in Austria’s Salzburg County. Simply request your non-binding holiday offer for the Alpenhotel Perner in Obertauern here.